Harry and Jesse have returned to Earth-1 for assistance with a new development: Jesse's speedster abilities. Meanwhile, a meta-human is out for revenge, Joe tries to talk to Wally in his "dad-cop" voice, and Barry still hasn't had a good date with Iris. Oh, and Dr. Alchemy has been lurking around the city doing what villains do best: ruining lives and cultivating evil. Sheesh, there's so much drama it's like this is a CW television show or something. I've missed Harry so much, so when previews revealed he was coming back through a breach, I was screaming. And it was glorious. I wasn't sure if we would see Tom Cavanagh this season since it's a new timeline and they haven't mentioned Wells yet. But I'm perfectly fine with Earth-2 Harry returning. He definitely helped with the whole "tanker in the sky" thing, and I adored seeing him get all "overprotective father" about Jesse's new speedster abilities. I have missed his sass! Dear Harry, never leave. Like I've mentioned before, I have been waiting for the writers to address the whole "Jesse and Wally got hit by dark matter" subplot from season 2. Finally, finally, we get to see some of the side effects, and I'm stoked (aka there was more screaming). Jesse has speedster powers and a determination to be a hero. I love it. I think this gives her character so much more than she had before. Plus, she gets a super suit, and the team-up with Barry was awesome! More, give me more! While Caitlin has been hanging out in the background lately (don't worry, she'll get her moment soon, I'm sure), she rocked in this episode. Not only did they hint once more about her Killer Frost abilities manifesting--and her fear of them--but she was on point about Harry's treatment of Jesse and her new speedster abilities. Thank you, world, for giving us Caitlin Snow. She's wonderful. The sort-of villain in this episode was interesting. I'm glad it connected back to the mysterious husks and Dr. Alchemy. Her manifestation gave us a little more on what Dr. Alchemy is doing--restoring abilities to the people who had them in the Flashpoint timeline. We haven't gotten all the answers, but the show writers aren't keeping us completely in the dark either. I liked how Team Flash handled Frankie. The only thing I was a bit so-so about was the extent of her abilities--they didn't explain the origin of her abilities, what being "Magenta" really meant, or why she was so powerful. But alas. Dr. Alchemy continues to be an enigma, and I'm actually intrigued by him now. He's restoring abilities from Flashpoint--but why? What's his deeper goal? Also, he killed Clariss/Rival. I wasn't expecting that because I thought Clariss was going to be a greater foe for the season. People are theorizing who Dr. Alchemy really is. Some people are pointing at Julian, Barry's new partner who didn't exist before, and while he does act a bit weird about some things, I think that might be too obvious. (But then again, Zoom...) However, I'm wondering if it's possible Dr. Alchemy is the original Harrison Wells--since he hasn't appeared yet in the timeline. It may not be, but it's something to think about. The constant struggle of Barry and Iris to be together is getting a little old. While I was glad they're finally moving forward, I just don't care. They're still super awkward. Oh well. This felt like The Flash I love. This episode was solid. We got more metas and hints at the season villain. The writers are moving forward with more comic book speedster lore. Overall, this episode was great. 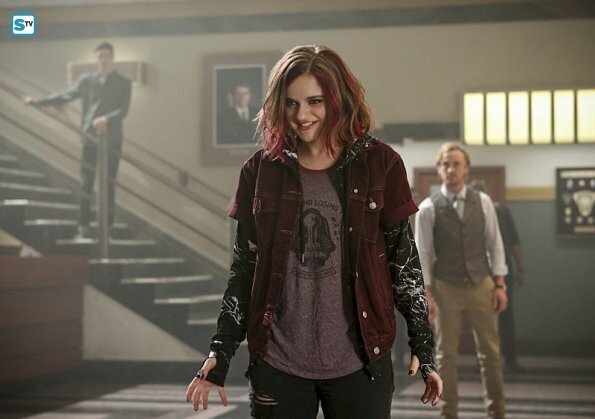 What did you think of "Magenta"? Who do you think Dr. Alchemy is?